The human rights situation is highly repressive and independent civil society organisations are not able to operate in the country. This update covers developments relating to the protection of freedom of expression, association and assembly in Turkmenistan from October to December 2018. International Partnership for Human Rights (IPHR) and Turkmen Initiative for Human Rights (TIHR) have prepared it for the CIVICUS Monitor based on TIHR’s monitoring of the situation in the Central Asian country. During the reporting period, the economic crisis deepened in Turkmenistan, with residents forced to stand in line to buy bread and other necessities. However, the authorities denied these problems, using state-run media as a tool for state propaganda and obstructing the dissemination of independent information about the crisis, including by banning the sale of satellite dishes. The case of a pensioner who was subjected to pressure after speaking out about the unlawful seizure of his apartment highlighted the dangers people may face when publicly expressing discontent as reported in the Expression section. The authorities continued to mobilise residents for public celebrations and days of free labour, threatening with repercussions for the refusal to participate. The government continues to use national media, all of which is state-controlled for propaganda purposes. In doing so, it also obstructs the dissemination of information about the real state of affairs in the country. In particular, the government continues its efforts to cover up the impact of the serious economic crisis in Turkmenistan. The reporting period saw a worsening deficit of basic foodstuffs such as bread, flour, cooking oil and eggs, resulting in rationing and long lines outside state stores selling food at state-regulated prices. The situation was particularly bad outside the capital, but Ashgabat residents were also affected. In November 2018, TIHR reported about Ashgabat residents queuing for hours outside state stores to get hold of bread sold as one loaf per person. National media outlets ignored these developments and continued to report about the alleged well-being of the nation and its people. For example, in early December 2018, state TV broadcasted a clip about the production and distribution of different types of bread and bakery products in the country, without mentioning the current difficulties of residents with respect to securing bread for the day. As covered previously on the CIVICUS Monitor, President Berdymukhamedov has repeatedly called on national media to focus on covering the achievements of the regime. During a government meeting on 10th December 2018, the President again did so, insisting that national TV and radio should take “proper steps” to “uncover the essence and objectives of the grandiose transformations launched in the country”. The Prague-based Turkmen service of Radio Free Europe/Radio Liberty (RFE/RL) reported that the security services questioned some 300 local residents after it published a video on 4th October 2018 that featured footage of long bread lines in the city of Dashoguz. This was done in an attempt to find out who had provided the media outlet with the footage. The Netherlands-based Alternative News of Turkmenistan (ANT) reported that it subjected to massive cyber-attacks in November 2018 after publishing several stories about the increasing poverty in Turkmenistan. The ANT said that the attacks originated from inside Turkmenistan and that it believed that the national security services were responsible for them. Similarly, TIHR’s website, which provides independent information about developments in Turkmenistan, is also regularly subjected to these attacks. As previously covered on the CIVICUS Monitor, authorities have waged a campaign against satellite dishes for years, arbitrarily removing such devices to prevent residents from accessing foreign TV and radio channels that provide alternative information about the situation in the country. In a recent development, the authorities banned the sale of satellite dishes. Market traders in Ashgabat told the Turkmen service of RFE/RL that they had been informed about this ban last summer and were threatened with repercussions should they not comply. According to RFE/RL, by November 2018, the sale of satellite dishes had virtually stopped in the capital. The government has repeatedly promised to promote internet development and ensure internet access across the country. In mid-November 2018, state media reported that residents of small and remote villages would be granted mobile and internet access in a ”near future” without providing any details on these plans. According to TIHR’s information, many village residents in the country lack both mobile and internet access. These residents have to travel to the district centres or larger cities to make phone calls or send messages, as well as to use the internet. Even just 10-15 kilometres outside district centres, the reception signal is often too weak to make or receive calls. The state Altyn Asyr (Golden Age) operator is the only operator providing mobile and internet access in the country. Anyone who openly criticises the authorities is at risk of persecution in Turkmenistan. Eighty-two-year-old pensioner Kaki Gurbanov reported being targeted after complaining about the unlawful seizure of his apartment. In a video appeal that TIHR published in May 2018, the Ashgabat-based pensioner stated that his apartment was seized in 2008 when he was away visiting relatives in another city for a few days. As a result, he was left homeless. Gurbanov said that the reasons for the seizure were not clear to him and that he submitted numerous appeals to different authorities to no avail. The new ombudsman’s office, which began its work in 2017, concluded that his rights were violated in connection with the seizure but said that it did not currently have sufficient resources to look further into his case. Following the publication of the video appeal, law enforcement officials began intimidating Gurbanov, demanding that he stop submitting complaints. According to TIHR’s information, on 27th November 2018, Gurbanov received a call from the local prosecutor’s office, summoning him to appear at this office the same day. As Gurbanov was ill at the time, he only went to the prosecutor’s office two days later. He was then told that his case had been handed over to the police. At the police station, he was told that he was under investigation because he had allegedly offended an official from the prosecutor’s office and that he should “wait at home” and that they would “come and get him with handcuffs” when needed. As of 30th November 2018, Gurbanov stopped answering phone calls, alarming TIHR that feared that he may have been abducted and therefore informed international human rights organisations and media. On 8th December 2018, Gurbanov finally got in touch with a TIHR monitor in the country, saying that he was fine but refrained from sharing any additional information. On 6th October 2018, an event to commemorate Memorial Day was held at a national memorial complex on the outskirts of Ashgabat. State employees and students had been ordered to attend and to show up at the complex at six o’clock in the morning to lay down flowers. In spite of cold weather and heavy rain, they were not allowed to bring umbrellas or wear warm clothes, to ensure a coherent appearance of the participants. After laying down their flowers, the participants had to stand for more than two hours, while the official ceremony continued in the presence of the president, government officials and foreign diplomats. On Neutrality Day, which is celebrated every 12th December, state-organised celebrations took place in cities across the country. In Ashgabat, the celebrations began with the laying down of flowers at the Neutrality monument, which is located at the outskirts of the capital. Employees of state institutions and public organisations, as well as students were mobilised to participate in these celebrations. They were ordered to appear at designated places early in the morning and to buy flowers for laying down at the monument at their own cost. All representatives of the same institution were expected to have the same type of bouquets. The authorities also continued to organise so-called subbotniki, meaning days of free labour, a practice dating back to the Soviet-era. State employees and students are regularly mobilised to rake leaves, wash roads and carry out other tasks at the threat of being dismissed, losing their places of study or facing other “problems” if they refuse. Given the nature of the participation in the subbotniki, this practice is a violation of both freedom of peaceful assembly, a key element of which is voluntary participation in gatherings , and international and national labour law which prohibits forced labour. In one example, in mid-October 2018, people were mass mobilised to plant trees across the country. Two thousand people took part in a subbotnik held on the outskirts of the city of Turkmenabad. In another development, in November 2018, TIHR received information about police and government officials visiting and intimidating people organising weddings, funerals and other social gatherings in the Mary region. The officials demanded that the hosts of events reveal where they had procured enough flour and bread for all their guests given the current scarcity of these products in the country. Turkmenistan’s new constitution guarantees the right to form and join associations, however, in practice, independent civil society organisations are not allowed to operate in the country and those working in exile are subject to threats and attacks. 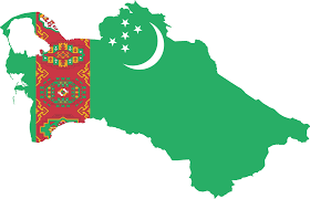 Turkmenistan’s new constitution guarantees the right to form and join associations, however, in practice, independent civil society organisations are not allowed to operate in the country and those working in exile are subject to threats and attacks. The 2014 Law on Public Associations governs the registration and operation of civil society organisations. The law imposes numerous obstacles on the effective realisation of this right, including wide discretionary powers to intervene in the internal affairs of CSOs and penalties for those operating in unregistered organisations. In practice, human rights defenders, activists and their families are subject to arbitrary arrests, harassment and travel bans. Authorities promote government-supported and controlled organisations, so-called GONGOs, including Soviet-area structures such as youth, women and veteran unions. There are no NGOs addressing human rights or other politically sensitive issues. Even human rights groups operating in exile are subject to pressure from within Turkmenistan, including attacks on their websites and vilification of their leaders. Though article 43 of Turkmenistan’s new constitution also guarantees the right to freedom of assembly, protests are not a common occurrence in the country. Though article 43 of Turkmenistan’s new constitution also guarantees the right to freedom of assembly, protests are not a common occurrence in the country. The 2015 Law on Organization and Conducting of Assemblies, Public Rallies, Demonstrations and other Mass Events governs the exercise of this right. The legislation bans gatherings from taking place in certain locations and local officials have wide discretion to refuse assemblies on the grounds that the proposed venue is unsuitable. According to the law, only one-person pickets can be held without informing local authorities, and no other spontaneous assemblies are foreseen. It is prohibited to hold assemblies with foreign financial, material or other support. The Code of Turkmenistan on Administrative Offences penalises “unlawful assemblies” and “other mass events in an emergency situation”. A lack of awareness that citizens have the right to protest, coupled with fear of retribution means that voluntary demonstrations or assemblies do not happen frequently in Turkmenistan. In contrast, the state itself often compels its citizens to take part in mass gatherings to celebrate state occasions or to welcome the president when he visits different parts of the country. The legislative framework provides safeguards for the exercise of freedom of expression, however, in practice, the government controls media outlets and restricts access to independent sources of information. The legislative framework provides safeguards for the exercise of freedom of expression, however, in practice, the government controls media outlets and restricts access to independent sources of information. Defamation remains a criminal offense and Turkmenistan’s Criminal Code treats defamation of the president as an offense similar to those of attacks on his health and life, with slander of him punishable by up to five years in prison. Although the government has committed to giving everyone access to the internet by 2020, access remains limited and controlled by the State. The government often blocks access to certain sites and monitors user’s activities. The few journalists still working in the country are subject to intimidation, arrest and harassment.